And waaaaaaay cool that you are going in the City to Surf...might try that one of these days! 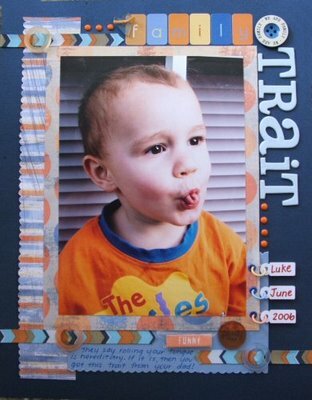 I love this layout and photo of Luke, so cute and clever isn't he. Beth...so pleased you are entering the EDM comp...the themes are grreat so far and what an adorable layout of Luke to start your album off. Have fun at the retreat, can't wait to see the LOs you create. Have fun at your retreat!! Love the LO! LOLOLOLOLOLOLOLOLOLOL - I'll be watching for that monkey!! !